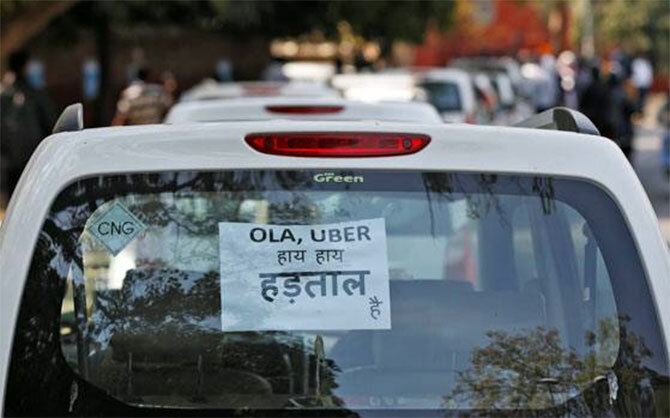 Rediff.com » Business » Why are Uber, Ola drivers upset? Cab aggregators caught between showing profitability to investors, increasing their network and dabbling in areas such as food ordering have seen a major blow to their primary business. It was a promise of monthly earnings of anywhere between Rs 80,000 and Rs 100,000 that made Ghanshyam Jadhav, a father of three, take a loan of Rs 150,000 from relatives as down payment for a new Swift Dzire car. 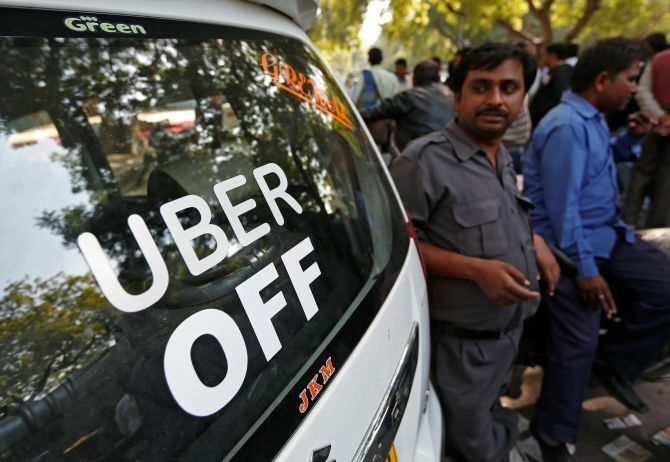 A year-and-a-half ago, following advice from a friend, he joined the 300,000-plus fleet of Uber and Ola cab drivers in the National Capital Region. Initially, for Jadhav, things were fine. He was earning around Rs 65,000, and after fuel money, maintenance charges and commission charged by Uber and Ola, he was able to take home around Rs 30,000. Cut to November 2018, soaring fuel, inflating commission rates of cab aggregators, rise in the number of cabs led to Jadhav's income -- without expenses dwindled to Rs 35,000 a month. This forced him to give up his car, and start working as a cash courier for a small financial firm. The dream of being an 'entrepreneur', something the cab aggregators promised their 'driver partners', ended for Jadhav. The situation is the same for thousands of other drivers, who periodically come out on the streets to protest against the two biggest cab aggregators. While the drivers have a range of demands, starting from not inducting additional cabs to verification of customers for safety, the main unresolved issue is still the diminishing monthly cash in hand. In the last two years, nearly 35 big and small protests of drivers have happened in the NCR, Mumbai, Kolkata, Pune, Bengaluru, Ludhiana, Chandigarh and other cities. The latest one being the almost two-week long standoff in Mumbai. While the companies claim the issues have been resolved, they have not been able to achieve a long-term solution. "Uber is pleased to announce that independent driver partners, registered with the Uber app in Mumbai, will return to work immediately, effectively ending a 12-day-old strike. A special Diwali incentive for Uber drivers set to expire November 5 will be extended till November 15 for those who resumed driving. Uber will endeavour to examine a fuel price-based earnings index to look at ways of making net earnings on the platform more sustainable," the Uber spokesperson said. 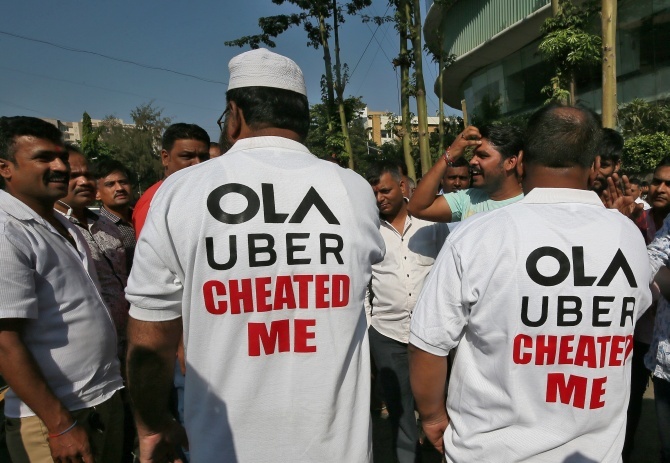 Its biggest competitor, Ola, sent a similar statement regarding the ending of the protest. From having health and life insurances, scholarships for children, to functions and parties to cheer up drivers, cab aggregators are trying everything, but increasing the monthly take home of a driver. Even after multiple strikes, nothing seems to have changed. "Even after a year or so of launching our series of agitations, the situation is still the same. They said our income would be close to Rs 100,000. We took loans, bought cabs, and initially earned Rs 80,000 to Rs 90,000 monthly. Slowly, the commission increased and the income fell," said S P Soni, general secretary, Sarvodaya Driver Association, New Delhi. According to an industry insider, cab aggregators caught between showing profitability to investors, increasing their network and dabbling in areas such as food ordering have seen a major blow to their primary business. Plus, the people they hire to deal with the drivers do not know how to manage a crisis. "Human resources exercises such as having functions to award employees, giving their children scholarships might work in a large corporate house. A driver, whose primary objective is to get the maximum cash in hand and use it to take care of his family, does not care about these initiatives. Companies need to become practical," said a CEO of a radio taxi firm. Uber and Ola do not charge any or less commission from drivers when they enter a new city. However, when the demand increases, they charge 25 per cent as commission.